Balin's mace, as seen in The Hobbit: An Unexpected Journey. Prop replica measures 41 3/10-inches tall and weighs 2 4/5 pounds! All the complexity and detail of the on-screen weapon! Comes with a reinforced polystone wall plaque for display. Created from molds of the original mace used in The Hobbit: An Unexpected Journey, The Hobbit An Unexpected Journey Balin's Mace Prop Replica from Weta Workshop is incredibly tough, yet safer than a sharpened steel blade. It's finished to a standard that can confidently be displayed in 3-D high resolution at 48 frames-per-second in the finished movie. Measuring approximately 41 3/10-inches tall x 7 9/10-inches wide x 3 1/10-inches deep and weighing about 2 4/5 pounds, Balin's Mace was cast using high-impact urethane to capture the complexity and detail of the weapon. The Hobbit An Unexpected Journey Balin's Mace Prop Replica even comes with a reinforced polystone wall plaque for display! An orator of eloquence and standing in the halls of Erebor before the coming of the dragon Smaug, Balin the Dwarf, eldest son of Fundin, was as quick in action as he was in wit. To match the fiery words he could conjure, Balin wielded in battle a long, flat-bladed mace, wrought in a coppery hue that caught the light and shone like a flame in his hands. Though age and long miles might tempered the keenness of the old warrior’s reflexes, both mind and weapon were as sharp as the day the dragon first descended upon the Dwarves’ mountain home, and Balin the Dwarf would not shy from drawing his star-pointed blade when foes threatened. Balin's Mace is part of a range of high-end authentic prop replicas from The Hobbit: An Unexpected Journey, all created by the artists in the filmmaking community of Wellington, New Zealand. Richard Taylor, Special Effects Supervisor at Weta Workshop, explains the use of urethane: "Although we use steel and aluminum to make a lot of our swords, often we benefit from the casting of these in a high-impact urethane as we are able to capture the complexity of detail we are wishing to cast into some of our weapons. 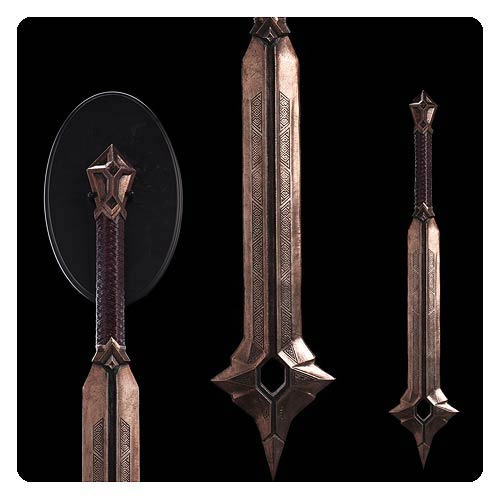 We have therefore chosen to present our collector’s edition of Hobbit weapons in the same material used for the making of the film props, to exactly replicate the techniques and artistry used in the films."